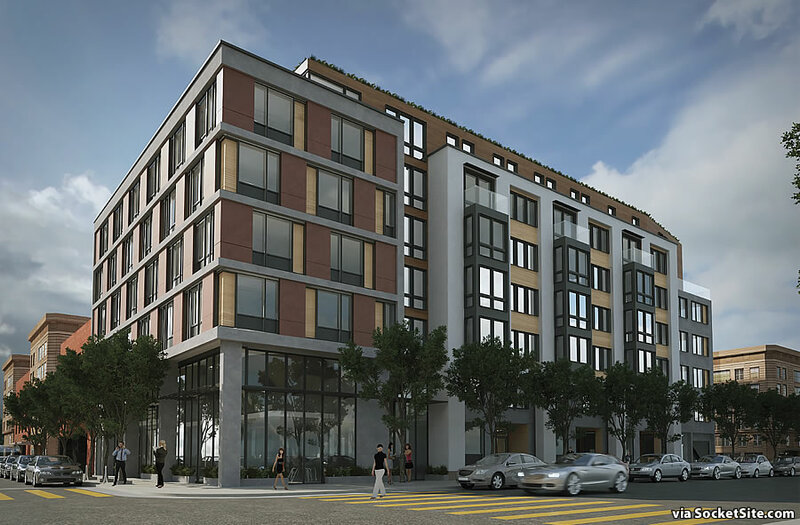 Having been redesigned to look less “muddled,” while adding a floor, last year, the proposed seven-story development to rise on the northwest corner of Folsom and Russ Street, upon the Fondue Cowboy and Deli Board site at 1052-1060 Folsom Street, has been redesigned anew by SIA Consulting, at least in terms of its aesthetics. The project’s proposed condo count, however, remains the same at 63 (a mix of 3 studios, 23 one-bedrooms and 37 twos), with a ground-floor garage for 17 cars with its entrance on Russ and 2,800 square feet of new restaurant/retail space on the corner. And the issue of casting some new shadow on Victoria Manolo Draves Park across the street remains. But next week, San Francisco’s Planning Commission is slated to approve the project along with a formal motion finding that the additional shadow cast by the project, would fall on the park’s entry, basketball court, and northern children’s play area, lawn and benches, and “would be present between February and October in the late afternoon beginning between 5:15 and 6 p.m., with an average duration of 72 minutes,” would not be adverse to the use of Victoria Manalo Draves Park. 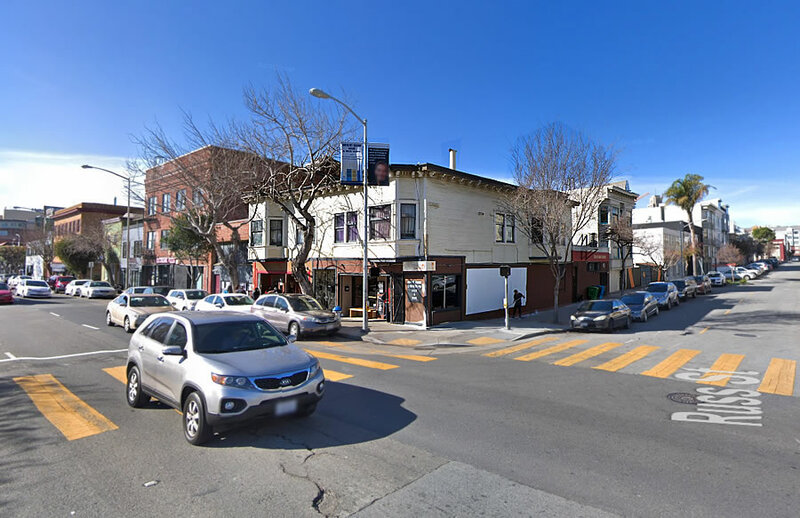 “The Department finds that the Project is, on balance, consistent with the Objectives and Policies of the General Plan, including the East SoMa Area Plan. It is an appropriate in-fill development that will replace existing rent-controlled units, add a significant amount of new dwelling units to the City’s housing stock, and provide 15 additional units of permanently affordable housing. The Project’s design is compatible with the pattern of development in the neighborhood, and additional shadow cast by the Project would not be adverse and is not expected in interfere with the use of Victoria Manalo Draves Park. Casting a shadow on part of a park, for part of the year, only at certain times in the late afternoon and early evening is the least “issue” issue there’s ever been. But somehow building parks in the space below elevated freeways and ramps doesn’t get the same attention. That’s how dumb our society is. Agreeeeeed! And the initial deco-manufacturing style of the design was far more interesting than this lumpy grey nothingburger. Regardless, All of SoMa should be this height (or taller), and I hope they actually move to build this. Absolutely — the previous design was better. Agree on the design. The old one was an interesting building I would notice and appreciate. The best I can say about this is it’s forgettable. I must not understand what “muddled” means in architecture terms because I would use that word on this design far more readily than I would the deco/industrial design. While I agree that shadow laws can be irksome (Salesforce Tower dropped from 1,200 feet in height to 1,070 feat in height to prevent added shadows to Union Square), the parks-below-freeways analogy is off. Shadow laws protect parks’ existing sunshine exposure. Whereas parks built below existing freeways reclaim desolate space for the surrounding communities. I’m in favor of building public spaces below elevated freeways and ramps. I’m just saying that there is no reasonable logical consistency in complaining about one but not the other. Shade is shade, regardless of whether it was there from the beginning or induced by later construction, especially with regards to park/recreation space. For example, the end result for the basketball courts at Draves Park vs Mission Creek Park would be essentially the same: both would be shaded (albeit the former only a small minority of the time). If casting a shadow on a rec space like this is deemed unacceptable, then it shouldn’t be acceptable to built one that’s in a shadow 100% of the time. Of course, that’s ridiculous and it’s okay for both of these to be in shadows some or all of the time. It’s a stupid thing to get hung up on. Oh, the horror! Traffic. Congestion. Parking. Elitism. Have I missed anything? i wouldn’t mind some Art Deco or Empire style frontages. i can’t see SFers/BoS complaining about those styles. hell, even a crazy ginger bread thing would break up all this steel and glass. funky is what made SF sf. They couldn’t shift the massing back to reduce the shadow? Considering SoMa has very few parks, and the shadow would fall right after work for most people, this sounds harmful to the park and neighborhood. I question if this would be dismissed as insignificant in a more well-heeled homeowner neighborhood. It is and would be insignificant no matter where it happens. It’s not a class issue. It’s a stupidity issue. Stupidity reigns in San Francisco at present. Billions for bums, but not a penny to fix what are the worst streets in the entire nation. Let that sink in…. ENTIRE NATION. I agree that heroin addicts have bigger problems than shadows, but SoMa residents coming home and wanting to play some basketball after work might mind. And that’s exactly the point: this is the only Western SoMa park of note, so it’s important to keep it attractive for more than just the desperate. I still see plastic straws everywhere in SF… everywhere. And you see needles all over the ground at Civic Center. We need a fleet of giant automatic Roombas roaming the streets/ sidewalks from midnight til 6am, 8 days a week. 100,000 techbros in this City one of them has to be smart enough to figure it out. even if we wipe the needles off the street, then they still go somewhere (the ocean, garbage dump) and literally stay there forever. we should stop giving them out. We are serving heroin addicts over the other 98% of SFers and the environment. im ok with handing out suboxone, but stop with the needles. Last I read, used needles get incinerated like medical waste, but maybe that’s only the ones collected in needle exchanges. I’m sympathetic to your argument that we shouldn’t be handing out needles; in a better city we would focus on promoting cessation of opioid use altogether. You of course are correct that we are serving heroin addicts over other San Franciscans, but advocates of continuing to hand out free needles will just say that their programs combat the spread of blood-borne diseases like hepatitis C and HIV and that controlling the spread of those diseases protects “the other 98% of SFers” from the deleterious effects of widespread heroin use. And in my opinion, giving someone Suboxone is only marginally better than enabling their addiction to recreational opioids because the buprenorphine in Suboxone is itself addictive just like other opioids. If the addict has been taking it for a long period of time and suddenly no longer receive it, they suffer withdrawal symptoms similar to those suffered when stopping other forms of opiates. Scott, you’re absolutely right, this 2-acre park actually constitutes 58% of the open park space in SOMA and an 18% shadow is a big deal (even if only present during height park use hours for children). If you’d like to help us inform people that this is a big deal for our community please tweet Matt Haney @MattHaneySF with the #shadowfreeVMD. Or if you’re interested in speaking up on this matter there will be an Appeal Hearing on April 9th at 3PM City Hall (Rm250). This is actually the second time Golden Properties LLC has proposed this project (the first in 2015). 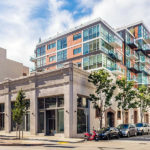 While new buildings are fantastic and everyone loves housing, I think it’s incredibly important to understand what a large impact a seemingly small shadow will have on our community (and yes all kinds of members of society live in SOMA) at a minimum the community should receive some form of compensation. A $25,000 donation was offered to the park during the 2015 project proposal (that shadow increase would have been from 6.35% to 10%) though nothing has been offered in the current iteration which will increase the shadow load from (6.35% to 18%). If you’re interested in speaking up on this matter there will be an Appeal Hearing on April 9th at 3PM City Hall (Rm250). The shadow analysis must be wrong. While living in the neighborhood for the last 20 years, I see that the sun sets to the NW, where the building is proposed, only in the Summer, when sunset occurs much later, even at 9pm. In Winter the sun sets to the SW, where the proposed building would have no impact at all. The building should be taller, not shorter.